Not surprisingly, the Fed pulled the trigger and raised short-term interest rates by 0.25% for the first time since last December. I thought I would convey what I think are the most pertinent variables to be monitoring in the wake of the Fed tightening. 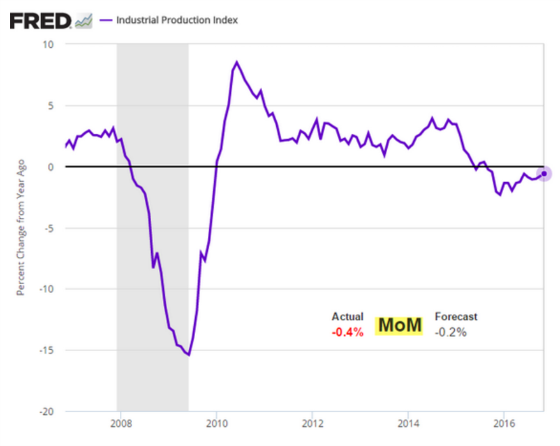 I’m calling this blog post “See and Wait” as I will be showing many charts and opine on some of the ramifications but we will have to wait to see how it unfolds in the real economy. 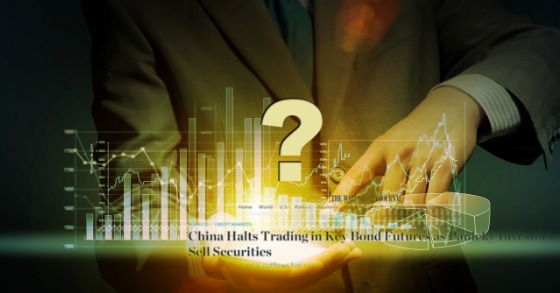 There is going to be a big battle between investor expectations and animal spirits and some powerful countervailing trends that we will have to see how they play out over time. 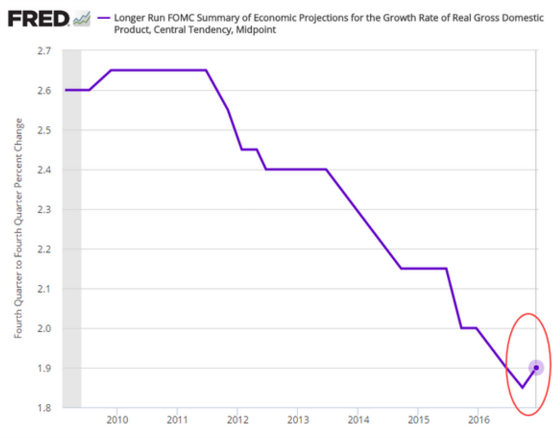 I’m still in the camp of slower growth and lower interest rates for longer and we will not return to rates we saw in the 1990s and early 2000s. 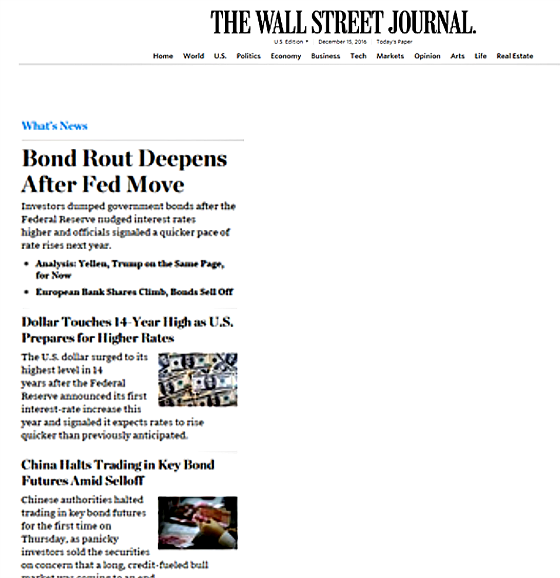 These headlines from the Wall Street Journal show some of the key issues I will be monitoring. 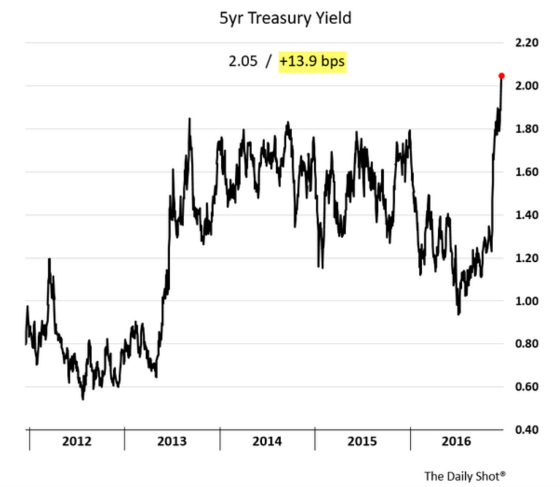 The higher interest rates that have resulted from the bond market carnage due to the shift out of bonds into equities, as well as the dollar and its impact on China, have been enormously powerful and I’m betting quite consequential on the U.S. and global economy. 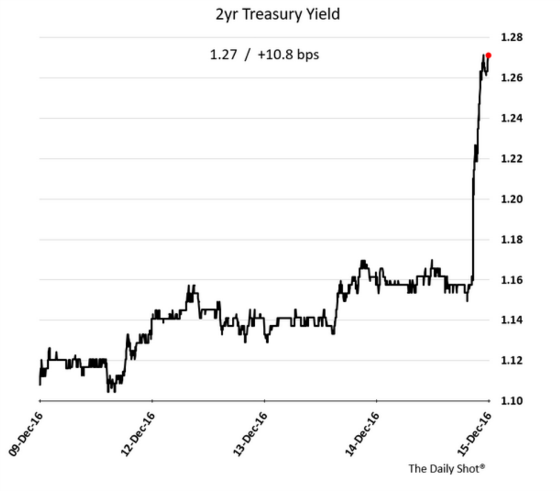 This is what happened to 2-year Treasury yields and 5-year Treasury yields after the Fed announcement. 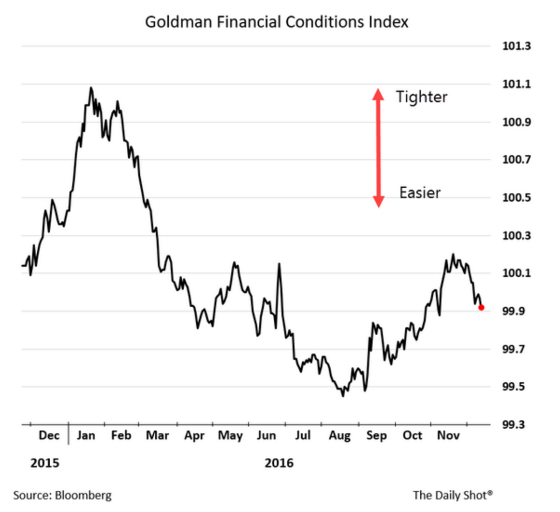 Financial conditions going into this rate hike were similar to what they were one year ago but after the last rate hike, they tightened dramatically. It will be interesting to see what happens now. So far so good but it is still early. 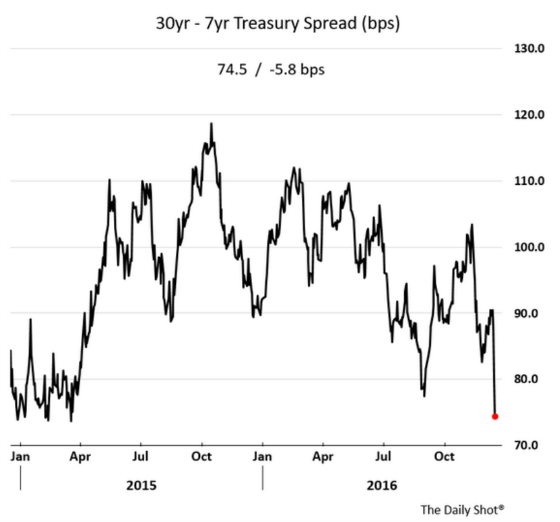 Interestingly, the major sell-off in the bond market has occurred despite the fact that, all things considered, the Fed is not very bullish on future growth and interest rates. By looking at the relationship between different Treasury securities one can infer thoughts that the market may have about future Fed tightening and economic growth. 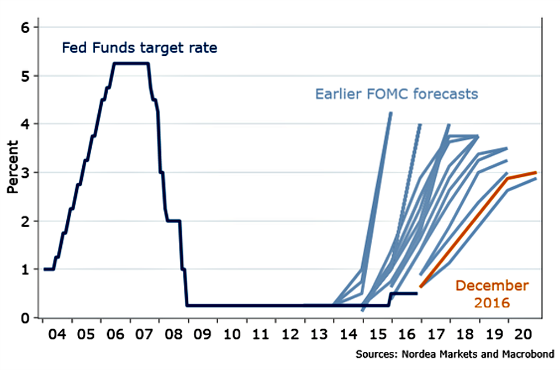 The first chart shows the curve steepening on the short end which is discounting a more hawkish Fed. On the other hand, it is flattening on the longer end which could be showing some concern as to whether growth and inflation will materialize. Forward expectations of future inflation have shot up but very recently turned down a bit. 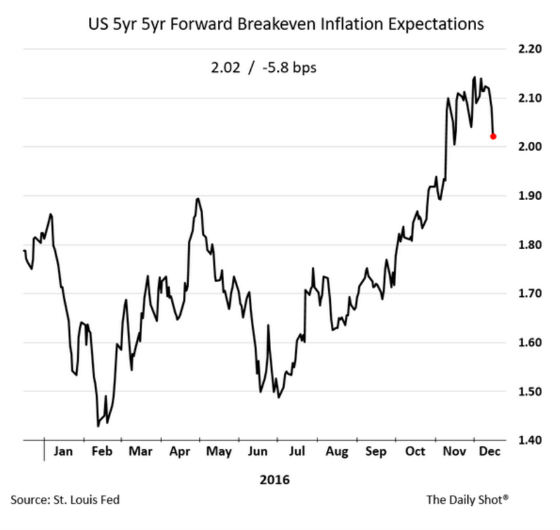 They’re now more in line with the Fed’s minimum inflation target of 2%. Housing is, of course, a big question in terms of whether it will be negatively impacted by higher mortgage rates. 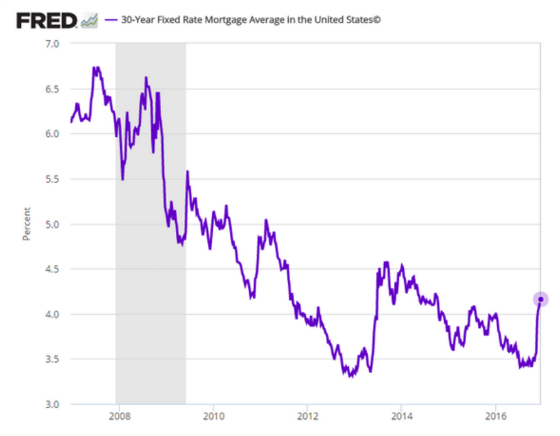 One can see that mortgage rates are still low from a historical perspective but they have gone up a fair amount in a short period of time which makes housing more expensive at the margin. 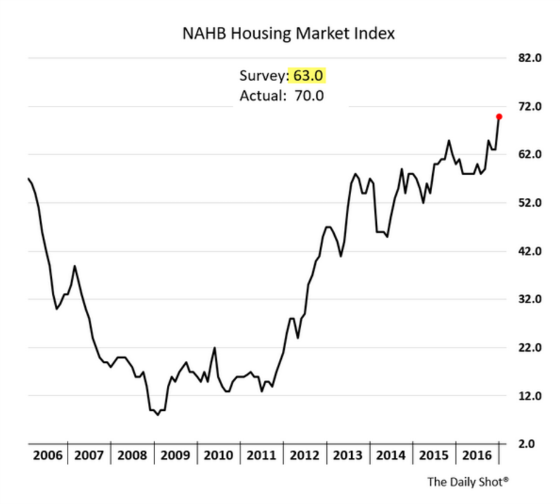 Homebuilders have not been this optimistic since 2005. Demand for housing still exceeds supply, inventory is tight, and prices have been increasing, Let’s see if this optimism is warranted as higher rates ripple through the economy. 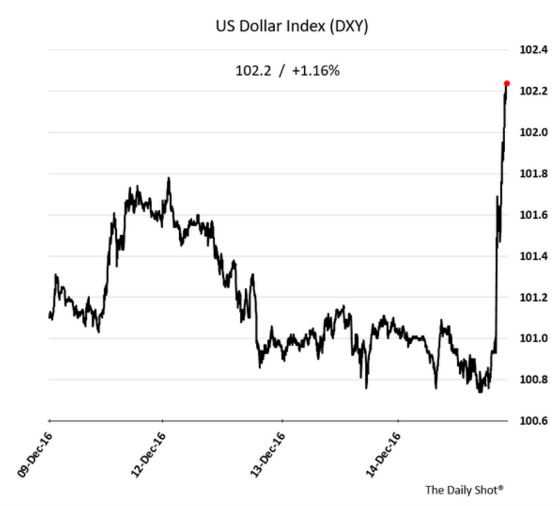 The dollar has been on a tear and this is having a major impact on China as its currency is weakening and interest rates are shooting higher as the government tries to minimize capital outflow. 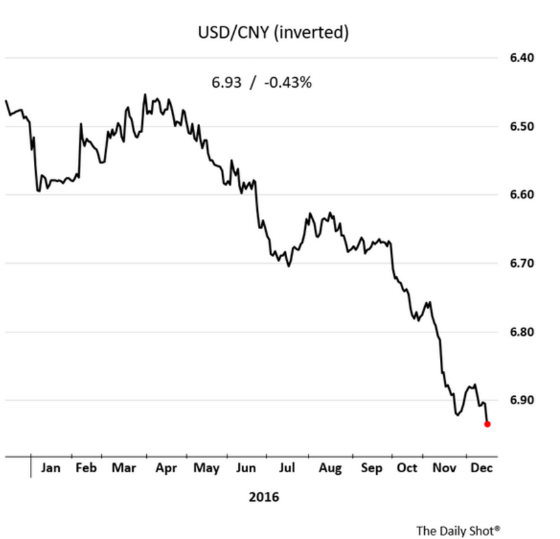 The Chinese currency has been weakening significantly. 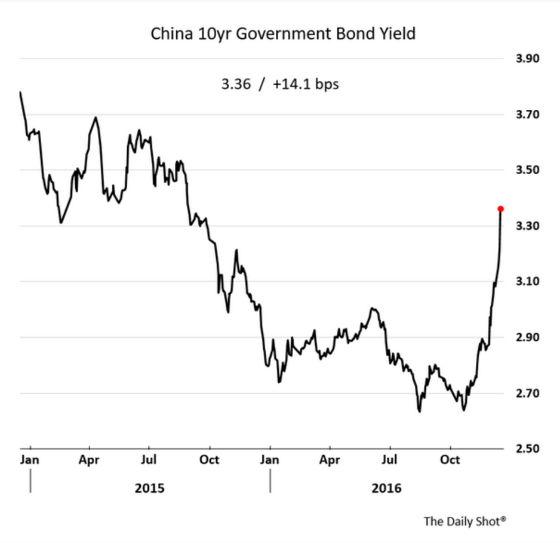 Higher rates in the U.S., capital outflows, renminbi depreciation, and deteriorating economic and credit fundamentals are putting pressure on Chinese interest rates. 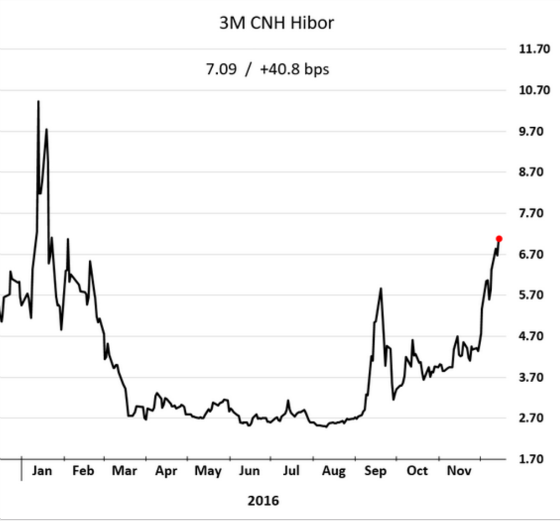 Short-term money market rates have shot up as there is a premium for liquidity in China now. 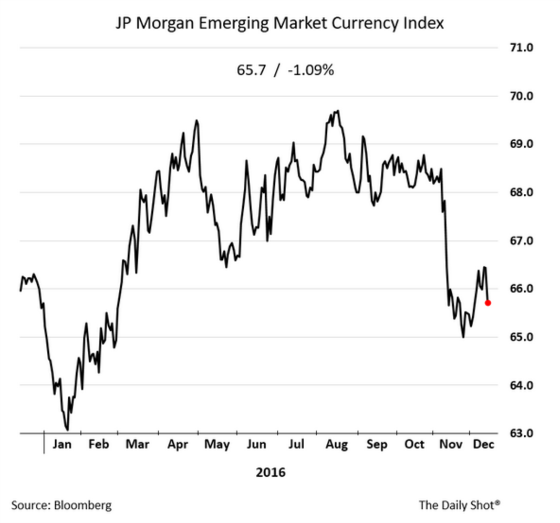 Emerging market currencies are dropping as well which will make it more expensive to repay a large amount of dollar-denominated debt many of these countries have directly or through their multi-national corporations. 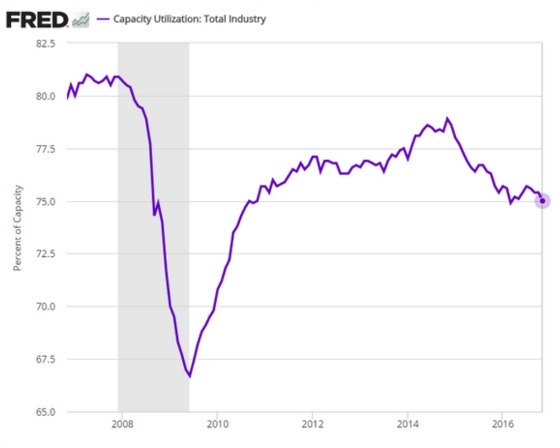 Finally, despite the significant increase in interest rates, the belief among investors that Trump will herald a new era of faster economic growth, we are still struggling to generate meaningful growth from an industrial production standpoint and this is translating to weak capacity utilization. A lot has changed in a short period of time with much of these changes betting on a much more robust economic and inflationary environment. 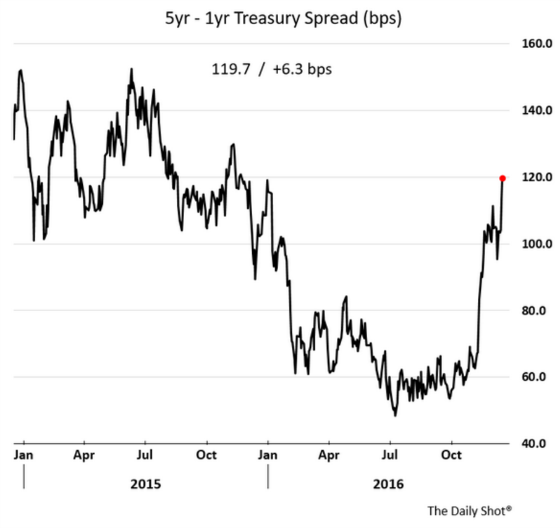 These changes have unleashed some headwinds in terms of higher rates and a stronger dollar that will have their own countervailing effects. I am still in the wait and see camp. These are powerful forces and when combined with the unchangeable demographic trends the world is faced with and will be the most important headwind for growth, I see a titanic battle between investor animal spirits and entrenched structural forces. Time will tell who will win. I am still betting on the structural forces but for now, I will sit comfortably and watch this heavyweight fight with great anticipation. 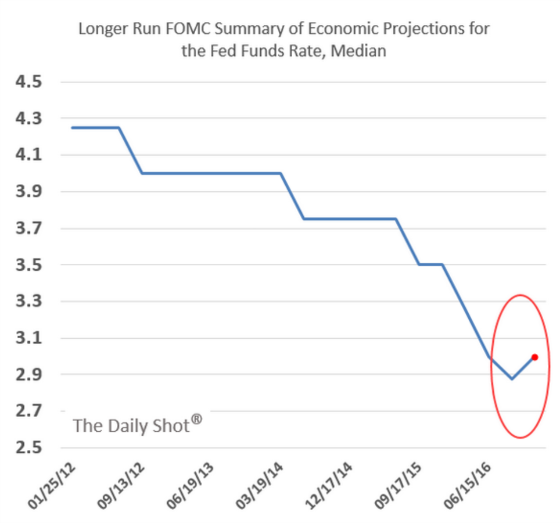 Are you in the camp of slower growth and lower interest rates? With the current economic climate will you see and wait or wait and see?